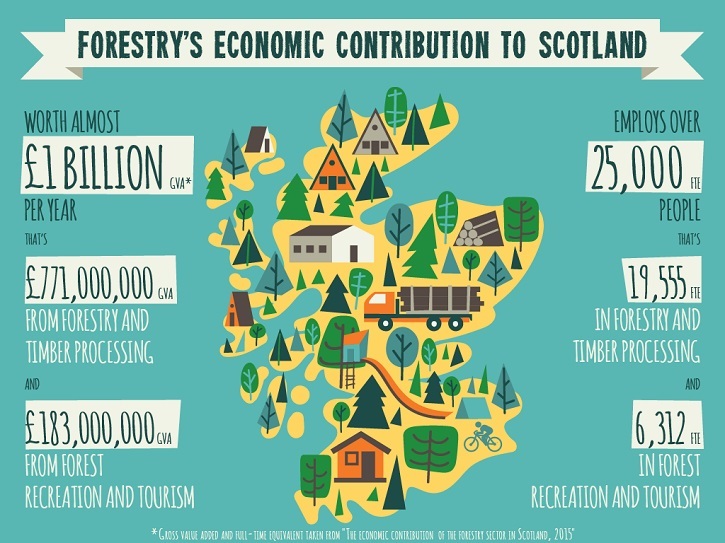 One of the objectives of Scotland's Forestry Strategy is to: "Increase the contribution of forests and woodlands to Scotland’s sustainable and inclusive economic growth". Scottish forestry contributes nearly £1 billion GVA to Scotland's economy every year and more than 25,000 people now work in the sector. Forestry makes a substantial contribution to the economy at both local and national level through the production of timber and other wood fibre, and the provision of recreation and tourism assets. The forestry sector is particularly important for rural communities, where the majority of economic activities associated with woodland creation, management, harvesting and transportation take place. employs 19,555 FTE people in Scotland. employs 6,312 FTE people in Scotland. boosting international trade and investment.